writing about books I read, movies I saw, music I listened to and politicians that pissed me off. Posted by Dirk under: books . 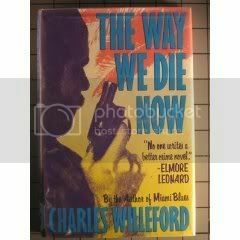 Willeford was an old school mystery writer. I believe this was the last book he wrote before he died. I think it’s the first of his I’ve read. It is ‘A Hoke Moseley Detective Thriller’. The book is pretty low key. It spends a lot of time going over the fairly humdrum day to day existence of the main character, a homicide cop named Mosely. Hoke Mosely seems very realistic. The whole book has that flavor of realism. When violence pops up in the book, it’s very sudden and brutal. Even there, the book seems realistic. I liked the book and will keep an eye out for more by Willeford. Jakedog.org is powered by WordPress and uses the Autumn Concept 1.0 theme created by Ed Merritt.